It made three, good sized portions so I’ve kept some out for tomorrow and the other one has gone into the freezer. Yes, I want to lose weight (so boring, I apologise for still blogging about this!) – a stone to be precise. I want a greater awareness of what my body needs in terms of food and exercise long term, not just to lose weight. Basically, to fully understand and adpot a way of eating that means I can lose the weight now and then adjust it once I reach ‘target’ as a way of eating forever more. Ditto for exercise. It needs to be part of the long term plan, not just for weight loss but for keeping my body healthy and in good working order! Trying to look after myself better in general by drinking more water, getting more sleep etc. Also, to make my days as stress free as possible and thus more enjoyable! To increase energy – I need it! Plan and prepare food for the next day: I’ll decide what I’m going to eat the next day and make myself a packed lunch, even if I’m going to be at home. This means I’m more likely to eat a proper meal – and something healthy – than if I don’t. I also make Husband a sandwich to take to work and take anything out of the freezer for Baby and for our evening meal so it is defrosted in time (I have an aversion to defrosting things in the microwave – don’t ask!). Plan my exercise for the next day: Based on what I am doing the next day (going into the office/working from home/ day off/ playgroup etc) I make a plan about what exercise I am going to do and get anything ready I need to. This means I am less likely to try and get out of it! Last night I decided I was going to do a 20 minute workout on a DVD before breakfast this morning. I put the DVD in the player and put my trainers in the corner ready to be put on. Tidy up: A very basic tidy up, putting all toys in the basket, clearing the table and sideboard so they are free from clutter, putting clothes/coats away, emptying the washing machine etc. It doens’t actually take more than 10 minutes but it makes such a difference. Taking off make-up etc: Something that seems to have gone out of the window – it must stop! Washing up before bed: I’d somehow got out of the habit. A sink and counter top full of washing up is not a good start to the day. So, just before bed I make sure all of the washing up has been done and that the counter has been wiped down. In the morning it has all dried and I just need to put it away. I wrote this list at the weekend and it is making a big difference already. I do 1-3 before dinner and it seems to take between 20-30 minutes which is fine. 4 &5 are at the end of the evening and take 10-15 minutes. This is all very manageable. I just need to stick with it! Breakfast is a tricky one for a lot of people, including me. For the majority of my adult life, it is the meal I have been most likely to skip. I’ve yet to see a diet that doesn’t advocate eating a good breakfast to get your metabolism going. The trouble is, I’ve never really felt hungry at breakfast time and I’m usually in a hurry. However, I did notice that when I was doing the India and Neris diet, eating bacon and eggs for breakfast really filled me up and meant I was much more likely to make it through to lunch without snacking. Can’t eat that forever though (I’ve since gone off scrambled eggs and omlettes in a big way!). However, I do know that I really ought to be eating a breakfast and have quite enjoyed sitting down with Baby in the mornings and having breakfast together. I really love oaty breakfasts – as in porridge or good museli (not those weird Oatibix things). Sadly, if I eat either of these regularly I whack weight on like there’s no tomorrow. Why?! I feel like whining ‘It’s not faaaaaaiiiir!’. Oats are supposed to healthy, right? I’ve piled on a few more pounds in the last few weeks and I’m pretty sure it is down to my oaty friends (and, yes, they are no added sugar and unprocessed). And yet I won’t give up! I love them! I know they are healthy! Let me eat oats! 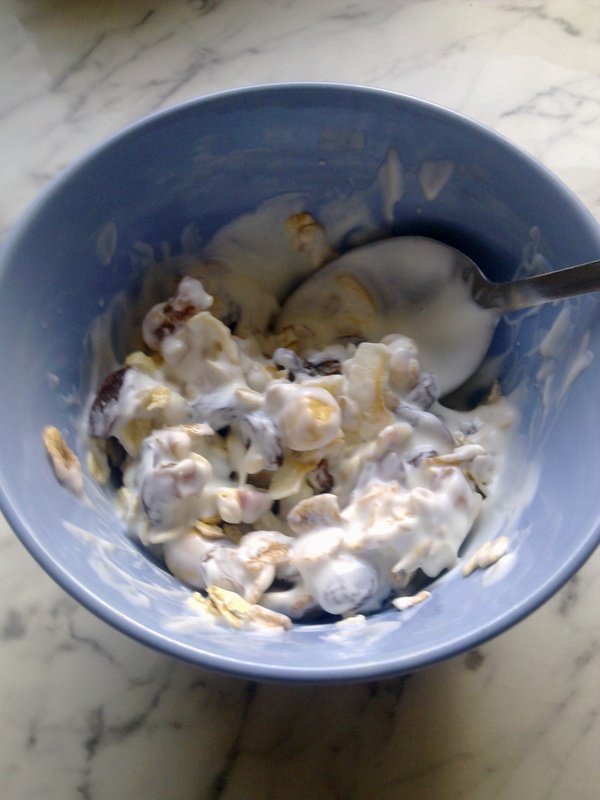 Museli mixed with fat free, probiotic natural yoghurt - my current, favourite breakfast! Seriously, I really want to be eating them regularly. At least every other day. I posted recently that I want to work towards making more healthy food choices and I really do believe that porridge and museli (the no added sugar kind) should/can be part of this. So, scales be damned, I’m eating them. Maybe I could switch to every other day though. But I think it is a really good way to start the day. Does anyone out there have the same problem? Or any other healthy, quick and easy breakfast suggestions? Food budget madness and an emergency list! We have plenty of healthy cereals for breakfast and can have sandwiches, soup or basic salads for lunches. Baby has her own section of the freezer which is well stocked up with meals. I’ll need to buy fruit, veg, bread, milk, eggs and yoghurt as and when they run out which I should have enough money for. I did order a chicken from a farmer though which is going to have to be paid for. Eek! Well, judging by the list above we aren’t going to be going hungry anyway! Spending on non-essentials: There is a balance to be found between spending and saving. While I don’t need a walk-in wardrobe full of new things to wear I also do not like things that look worn-out and scruffy. It is perfectly okay to buy new clothes, shoes or whatever providing that I save more than I spend each month. I know I keep saying this but I somehow need to make it ‘stick’ in my head! Enough with the spending guilt. 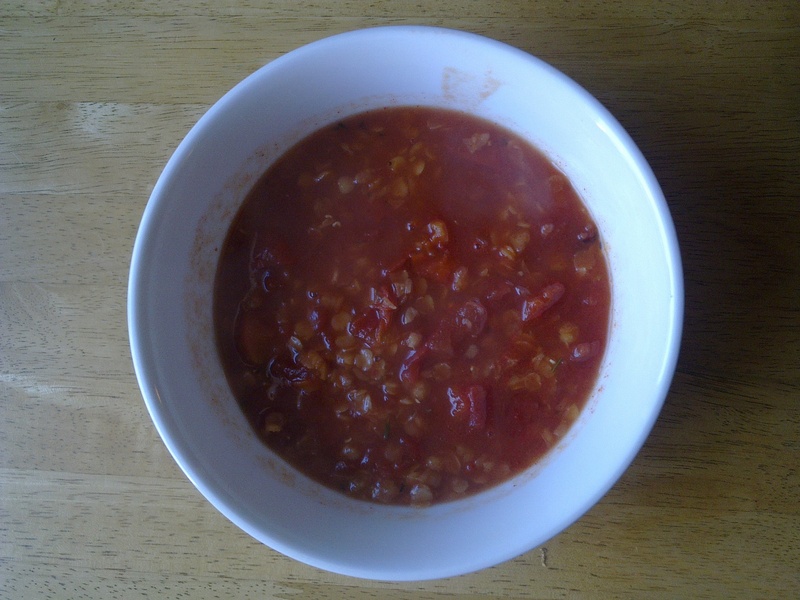 Food: I’ve blogged about experimenting with cheaper foods in recent months. The outcome is actually that I’m not always comfortable with these options. Cheap meat, for instance, is generally only cheap because it has been imported from somewhere with very low standards for animal welfare. I’m not okay with this and am going to be taking a much more pro-active approach by trying to find outlets for locally (and ethically) reared meat. And, in general, I am going to be trying to make much, much healthier choices which ultimately ought to sort out the weight issues. Moving house and domestic chores: No point looking at this until Spring now. Am going to forget trying to do any more things to the house until after Christmas (or unless I get really, really excited about something) so I am free to concentrate on the list above and, more importantly, my family. Ditto any decluttering projects and spring cleans. I am just going to keep things reasonably clean and tidy and wait until spring actually is here! Autumn/winter plans: I love this part of the year. Reading books on dark, windy evenings. Eating comforting stews while listening to the rain. Good films. Preparing for Christmas. I hate the weather after Christmas but love the weather on the run-up! Also, I need to make more of an effort to see some of my friends who don’t live on my doorstep. I keep waiting for a time when I don’t feel so tired and rushed but who am I kidding? I’m a working parent. Tired and rushed are in the job description! I also want to have a crack at a couple of crafty projects too. Financial planning: Can you believe I still have no idea what my take home pay is?! That’s right, after 5 months HM Revenue & Customs have buggered about so much that I have been paid something different each and every month. Oh well. I’d like to refine what I’m doing at the moment so I’ve got a clear plan and can set things up so they tick along without me having to think about it all the time. There are nearly 30 books so that ought to keep me going! Actually there are a couple of books on there that I’ve read before but want to read again (like Wuthering Heights because the one and only time I read it I found it both boring and funny for all the wrong reasons. It seems that this isn’t the general responce so I’ve long felt I should have another ‘go’ at it). 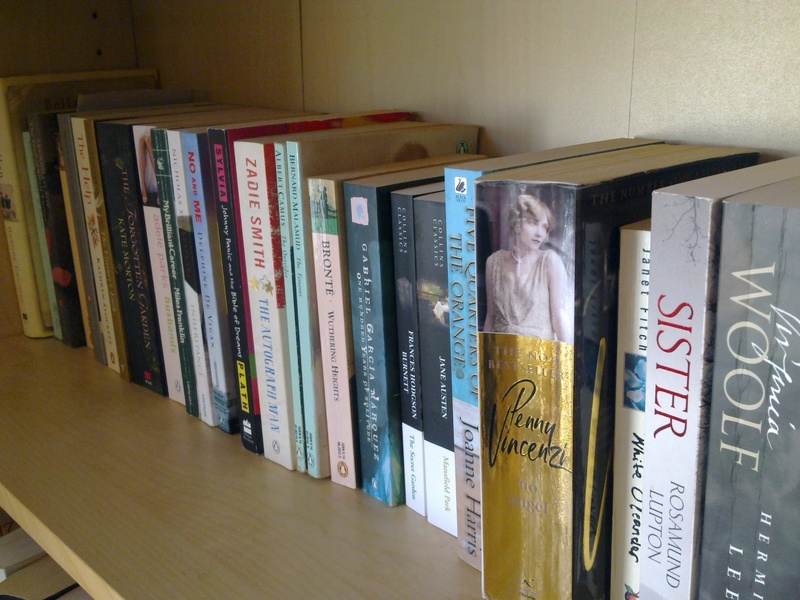 All of these books have either been bought second-hand, at a discount or have been lent to me. One or two were free with magazines. None were bought at full price! That should keep me going for a while. It also ought to wake my mind up a bit by making me read things I wouldn’t usually. If I really can’t get into them then I’ll give up and take them to the charity shop or return them to their owners. Some of these books have been knocking around the place for years! There’s a real mix of genres covering everything from classics to chick lit so there should be something to suit whatever mood I may be in when I’m on the hunt for a read! I’ll try to remember to do a post on each one as I go through them! I’m overwhelmingly underwhelmed at the moment. I know I’ve mentioned this but over the last couple of months I’ve become increasingly lethargic in the evenings. The evenings used to be a fairly productive time for me. I used to cook (maybe a batch of something), do my banking, make plans, clean, tidy, declutter – and that was if I was at home! Now it is as much as I can do to sit on the sofa and read a book or stare at the TV and try not to drool. I can’t blame the current teething episode for this as the lethargy has been going on much longer. I’m down with the whole autumnal hybernation thing (current spate of sunny weather aside) but this is a bit extreme! We’ve given up on any plans to put the house on the market before Spring so I’m thinking I might as well take advantage of the freedom of not having to have our home in showhome condition, embrace the dark evenings and start getting ready to cosy up for winter. Particularly since there has been talk of snow less than a month away! Is this right?! I can’t imagine it. Does anyone else have plans for autumn/winter evenings?